Citing irrelevant material as a means to question the credibility of an global warming expert’s science viewpoints is fundamentally unwise, particularly when the individual making the citation commits an inexcusable error in the process. But the credibility problem worsens when that person takes on the appearance of trying to inflate the number of sources for the irrelevant material, with a pair of ‘corroborations’ where one of them only cites the identical original source while the other only opens up a Pandora’s Box about the entire situation surrounding the – let me emphasize – irrelevant material. 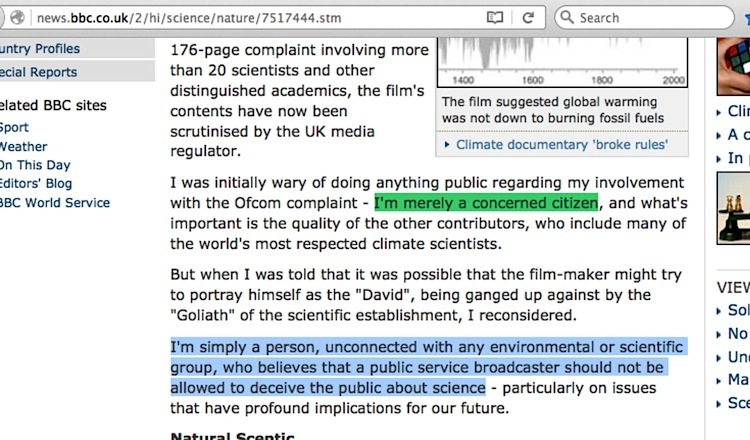 The individual I speak of here is self-described ‘concerned citizen’ Dave Rado, the person I’ve detailed over the past 4 blog posts as being someone beset with problems surrounding the official complaint he filed in 2007 over the UK Channel Four Television Corporation video “The Great Global Warming Swindle.” In the briefest of descriptions, Rado claimed the video presented biased information from scientists who were funded by fossil fuel interests, but it turned out he voiced a dislike of the video before viewing it, had a preconceived notion about the funding of skeptic scientists, and failed to disclose precisely who his complaint reviewer William Connolley was. 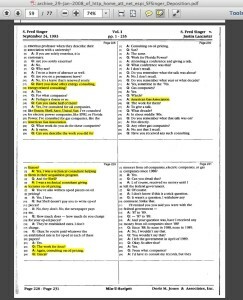 Additionally, hard questions need to be asked about the overall situation of his contact with one participant in the video, and whether he had undisclosed additional help in writing the complaint in order to get its vast content done within a very restricted time frame. 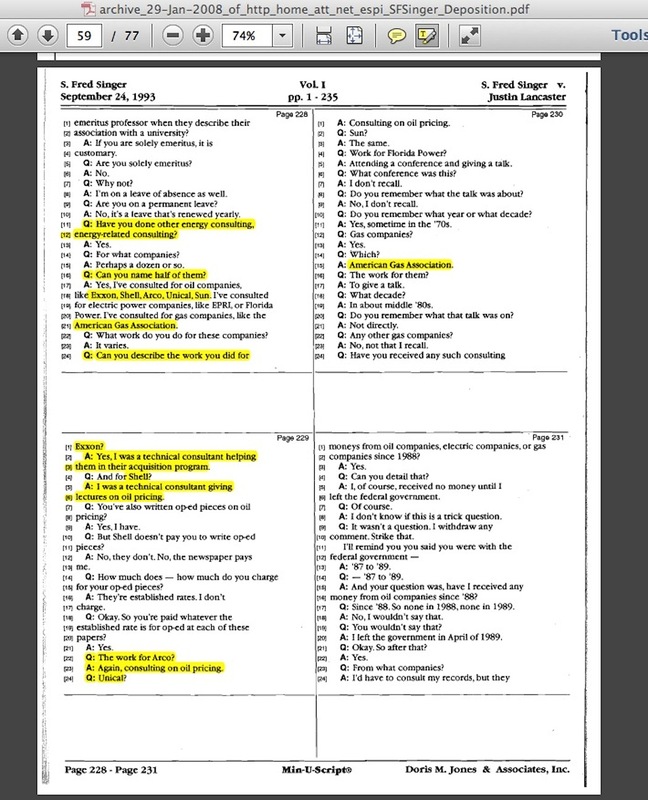 Today, an examination of just one particular sentence within his complaint against a different participant in the video, Dr S. Fred Singer, and how the sentence – which sounds quite damaging when accepted without question – falls apart under hard scrutiny while raising more questions about the origins of the smear of skeptic climate scientists. 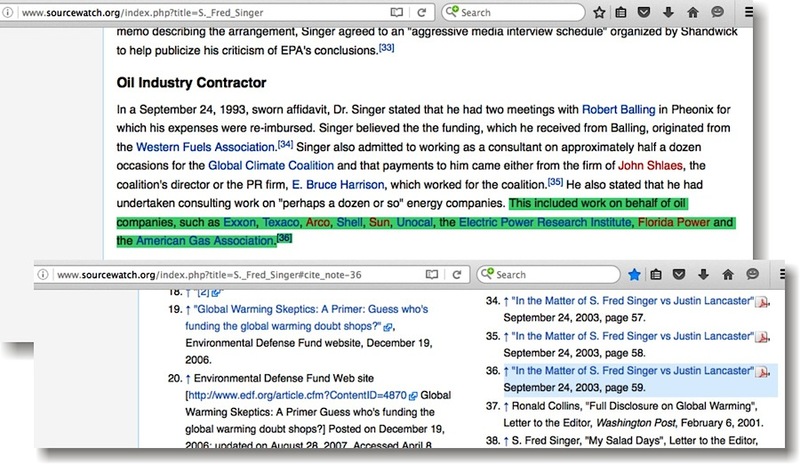 An anti-Kyoto, Anti-IPCC, anti-regulation lobby group founded and run by Frederick Singer, that has received $20,000 from ExxonMobil … as well as having received substantial funds from several other fossil-fuel industry sources including Shell, Unocal, Texaco, Arco, and the American Gas Association (see his sworn affidavit at http://tinyurl.com/2rrqz7; HeatIsOnline at: http://tinyurl.com/yqvozw; and Center for Media and Democracy: http://tinyurl.com/yloyf2). First, the inexcusable error, which is highlighted in red above. Rado’s complaint first cites his own archive link to Dr Singer’s affidavit, linking to the entire 1993 Singer v Lancaster deposition transcript, with no helpful reference to the place which backs up the statement. 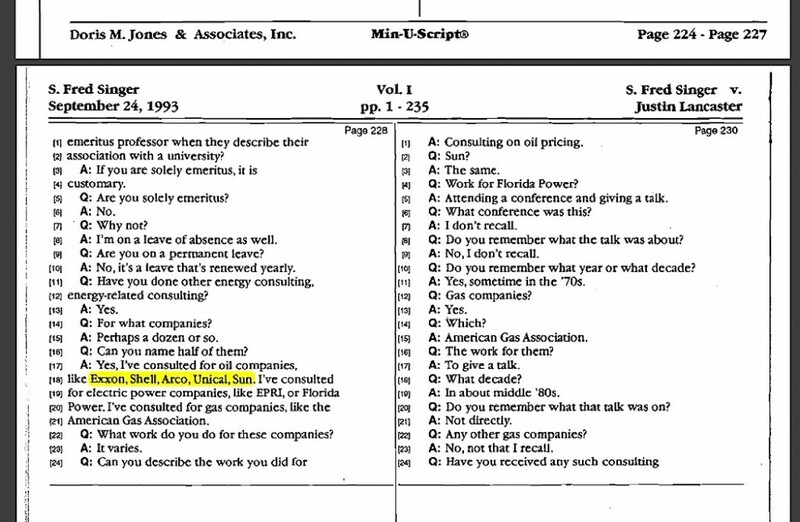 In my January 23, 2015 blog post detailing myriad problems with Justin Lancaster and Ross Gelbspan, I point straight to the transcript’s pg 228: “I’ve consulted for oil companies, like Exxon, Shell, Arco, Unical[sic], Sun.” There is no “Texaco” to be seen in that section of the transcript, and that name appears nowhere within the entire deposition. The blank PDF page shows Justin Lancaster’s old “home.att.net” internet page address for the deposition. It worked a few years ago, but not now, nor does Lancaster’s overall site. 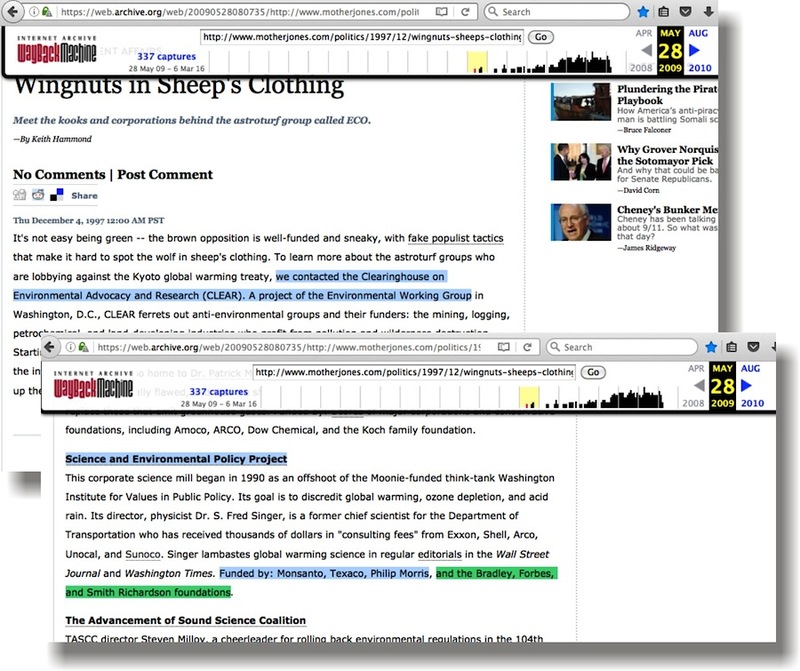 The current SourceWatch page for Dr Singer, with additional material, features a link for the above sentence that’s now numbered #36. What is stated for the footnote? 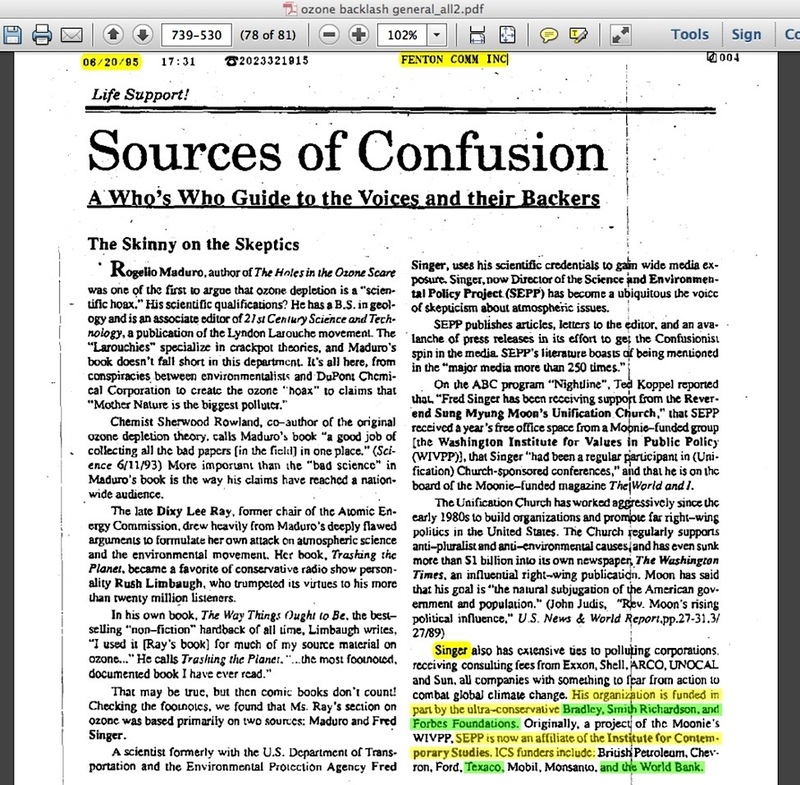 “In the Matter of S. Fred Singer vs Justin Lancaster”, September 24, 2003 [sic – 1993, see above], page 59. Again for emphasis, there is no “Texaco” in that section of the transcript, nor does it appear anywhere in the entire deposition. Does Texaco appear in Rado’s citation of Ross Gelbspan’s Heat Is Online web page dating from 2007? No, it does not. 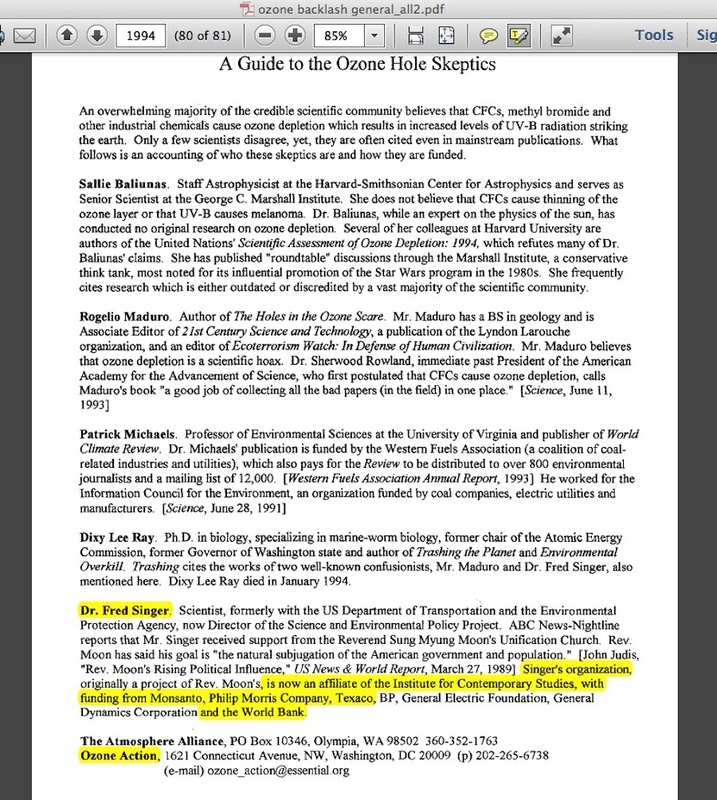 On a Nightline program in February, 1994, it was revealed that Singer has accepted ‘consulting fees from Exxon, Shell, Arco, Unocal and Sun Oil.’ According to Ozone Action, an environmental organization, SEPP has also received funding from Monsanto, Philip Morris, and Texaco. ….. The link for footnote #7 currently goes to a dead Environmental Working Group (EWG) page, but a search for the link at the Internet Archive site reveals a December 7, 1997 page with the verbatim wording. Who does Ozone Action source the Texaco name from? That’s where the digging starts. 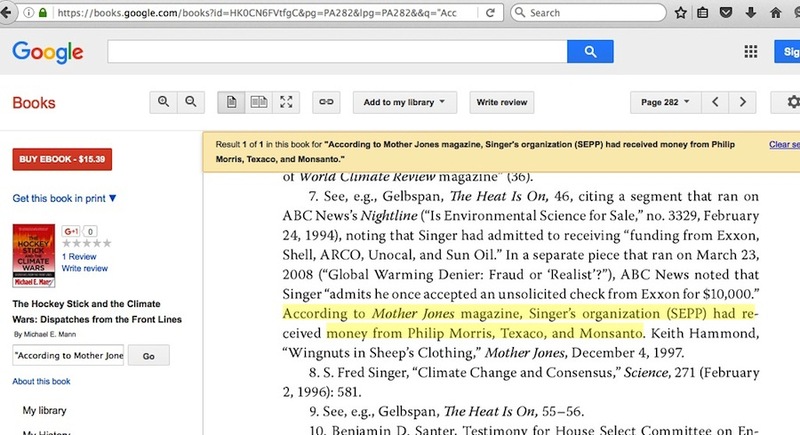 According to Mother Jones magazine, Singer’s organization (SEPP) had received money from Philip Morris, Texaco, and Monsanto. Keith Hammond, “Wingnuts in Sheep’s Clothing,” Mother Jones, December 4, 1997. Science and Environmental Policy Project … Funded by: Monsanto, Texaco, Philip Morris, and the Bradley, Forbes, and Smith Richardson foundations. Are those foundation names an ‘according to Ozone Action’ thing, too? A pair of pages seemingly point in that direction: Within Greenpeace’s archives (what I term “Greenpeace USA née Ozone Action” archives, page 80 here) is an undated, unsourced “Guide to the Ozone Hole Skeptics” with Ozone Action’s name at the bottom, no mention of the EWG, and the following wording…..
Singer’s organization … is now an affiliate of the Institute for Contemporary Studies, with funding from Monsanto, Philip Morris Company, Texaco, BP, General Electric Foundation, General Dynamics Corporation and the World Bank. 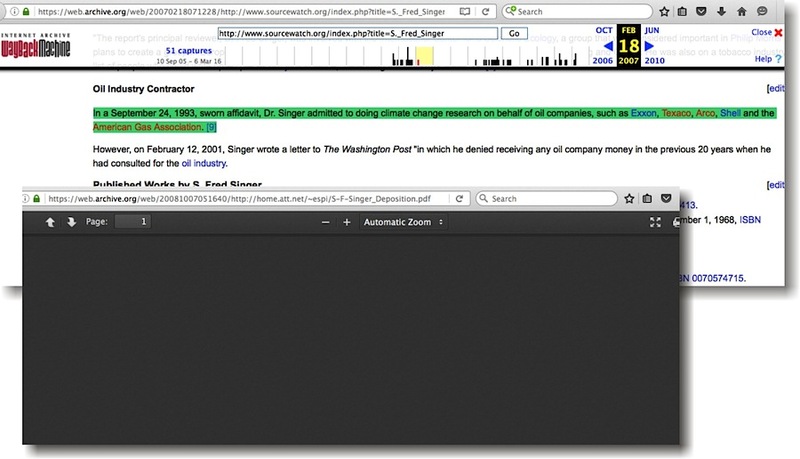 Singer[’s] organization is funded in part by the ultra-conservative Bradley, Smith Richardson, and Forbes Foundations. … SEPP is now an affiliate of the Institute for Contemporary Studies. ICS funders include British Petroleum, Chevron, Ford, Texaco, Mobil, Monsanto, and the World Bank. And now, that middle citation of Dave Rado’s about Dr Singer’s SEPP organization, to Ross Gelbspan’s Heat Is Online web page: Just how problematic is it? Let me count the ways. 1. It does nothing to alleviate the appearance of any prominent accusation against skeptic climate scientists being separated from Gelbspan by three degrees or less. 2. The reference to Gelbspan itself is extraneous. Dave Rado could have directly cited the Nightline program without mentioning anybody else. 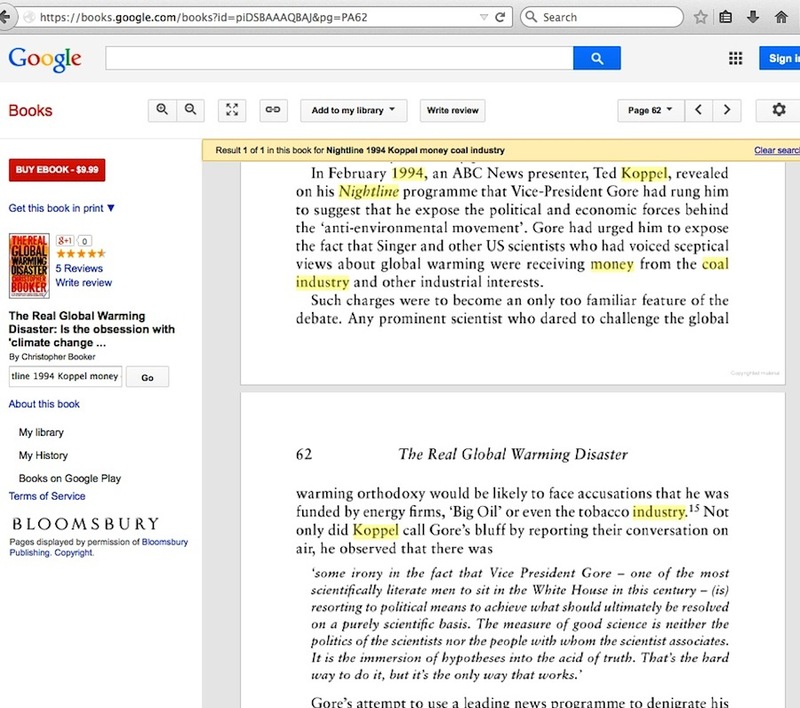 But that’s a problem because, as I described toward the end of my Gelbspan-Lancaster January 23, 2015 post, Nightline’s report was not an outright indictment of Dr Singer, but instead the program’s host heavily admonished Al Gore over his effort to use funding accusations as a means to tarnish the reputation of Dr Singer and others. Singer’s defense is that his scientific position on global atmospheric issues predates that funding and has not changed because of it. 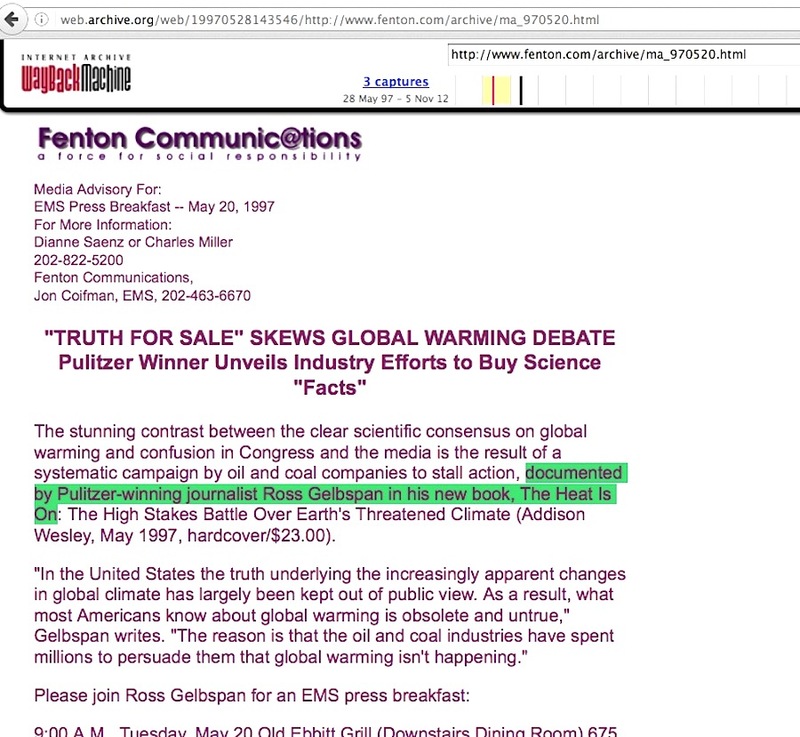 Accusations of corrupt fossil fuel industry influence over skeptic climate scientists are irrelevant material — worthless — in the absence of any physical evidence (full context document scans, undercover video/audio transcripts, leaked emails, money-transfer receipts) proving such skeptics were paid and orchestrated to lie about the certainty of catastrophic man-caused global warming. And it was Gelbspan himself who could not make the fatal problem more clear about this 20 year+ accusation. This entry was posted in Repeated talking points, Three degrees of Separation or Less and tagged Dave Rado, Fenton Communications, Justin Lancaster, S. Fred Singer, William Connolley by Russell Cook. Bookmark the permalink.